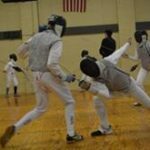 Mid-South Fencers’ Club offers the exciting, dynamic Olympic and Paralympic sport of fencing for people ages 7 and up in the Research Triangle of North Carolina. We teach classes and camps, offer individual and group lessons, and hold tournaments for all three Olympic-style weapons: foil, epee and saber. Since the club space opened in 2008, Mid-South has quickly earned a reputation of being one of the best places to fence and train in the United States. At Mid-South Fencers’ Club, our edge is multifaceted. Backed by our highly skilled and qualified staff, we offer a fencing home for all fencers, from beginners to competitors with collegiate, national, or international aspirations. We also have the national and international results to back us up. Whether you come to Mid-South to learn the basics or to train for a competitive goal, we are here to meet your challenge, inspire, and support you in a fun and dynamic sport.